NCISS Announces New PInow Benefits for Members Only! NCISS has recently formalized agreements with PInow to offer two new benefits exclusively to NCISS members. 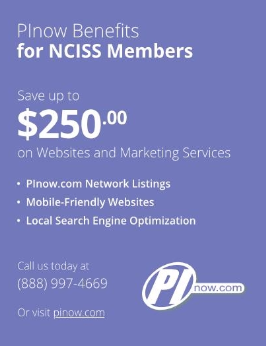 PInow recently offered several unique benefits to NCISS members. These benefits of PInow and ServeNow discounts for our members. The annual savings from just one of these benefits will pay the member’s annual dues – and save much more. NCISS also has a partnership with IRB Search, Office Depot/Office Max for discounts on copies, printing, and products exclusive to NCISS members. These benefits are at no cost to NCISS or members. Participants of these programs must be NCISS members. For information on joining NCISS, please visit the NCISS website.